Injected with organic silhouettes and neutral tones, it was undeniable that our new collection has nuances of iconic British artist, Barbara Hepworth, synonymous for her use of form and abstraction and the relationship between structure and location. Our Designers and Buyers instantly envisioned the tranquil and powerful nature of her pieces to sit perfectly within our new Hepworth Collection, portraying an organic style and effortless modernity through our design-led, carefully crafted, furniture pieces. After visiting the top UK and international trend shows such as Stockholm Design Week, Maison et Objet, IMM Cologne, Milan Design Week & Salone del Mobil, our Buying and Design teams collated the top trends and injected them into selected pieces within our new collection. From headboards to woven rugs, curved-back upholstery and an abundance of botanicals, stay tuned as we unveil our BoxNine7 spin on the must-have trends. The running theme of nature and organic beauty, observed at leading international design weeks, is a prominent theme in our handcrafted furniture pieces. Exclusively-made headboards have been re-designed, adding a contemporary touch by introducing soft-curved edges in neutral palettes. The additional selvedge gives our headboards a softer and more relaxed feel, allowing the dynamic artwork above to stand out within the space. Renowned not only for her three-dimensional sculptures but also her collection of vibrant, geometric styled paintings, we feel Hepworth’s pieces would powerfully juxtapose the organic forms within our exclusive furniture pieces, complementing the entire collection. Our Buying and Design team observed artisanal trends at every major trend show this season, a mixture of materiality from wool and rattan and hand-crafted techniques such as weaving, instils elements of travel and culture into select furniture pieces. You can find this trend incorporated within the hand-woven rug displayed in the main living space, exclusive to us here at BoxNine7. Renowned for her interpretation of the surrounding landscape within her artwork, we imagine Hepworth’s work to fit harmoniously alongside our hand-crafted artisanal pieces within our new collection. A key trend observed at Milan Design Week was the maximalism of botanicals and natural hues within a space. Our buyers interpreted this trend though the use of muted, earthy tones, contrasted with vibrant flashes of colour to create a unique and interesting collection for any contemporary space. 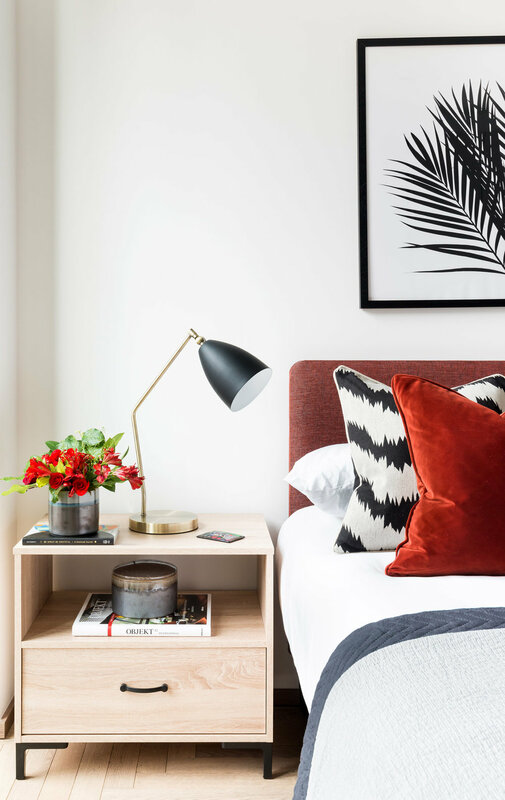 Our cushions compliment the tonal palette of each room with additional features such as fringing and graphic patterns creating an energetic vibe, allowing these accessories to become statement pieces within every room, similarly to Hepworth’s iconic and bold use of scale. It’s all in the details! Using a range of materials is key within our schemes to add dimension to each design, not only have we incorporated this trend throughout each room within the collection but also on stand-alone furnishing pieces. Our Buying and Design teams contrasted the use of traditional and contemporary materials such as dark woods, brass accents and rich velvets within the living room of the collection, creating a space that we envision a Hepworth maquette to perfectly sit within. We pride ourselves on our quality of product and all our collections are curated with an emphasis on first-class craftsmanship. Whether you are a private client, landlord or investor, this turnkey solution will minimise your property’s time on the market and create the perfect, tailored home. To find out more about our furniture collections, please get in touch.